Download the Excel file Pyramid Numbers. Use the the lower increment button to change the first number in the base line. How are the numbers in the base line related to each other? How are the lines above formed? Notice how the top of the pyramid relates to the middle value in the base line. How could the base line be a set of differently related values, and what would that do to the top of the pyramid? 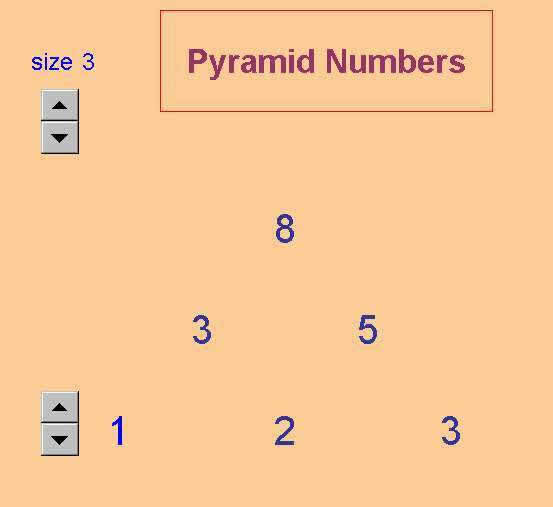 Use the upper increment button to try other size pyramids.